Collections and the passion for collecting is the theme of Shelf Life, a new and scintillating exhibition at the Haifa Museum. Visually exciting, with high quality works by 19 artists – four from abroad, it also includes critical commentary on the role of a museum. In a catalog text Tami Katz-Freiman (who curated this show, together with Rotem Ruff) refers to the Cabinet of Wonders, the forerunner of today’s museums, found in the homes of wealthy Europeans at the turn of the 17th century. Shown off to friends, its purpose of this cabinet was to display strange or precious objects that its owner had acquired on his travels. While it is far-fetched to view the whole exhibition as a Cabinet of Wonders, there are features in it that bring this social phenomenon to mind. None more so than the works of Tomer Sapir and Amnon David Ar. Sapir’s captivating installation Research for the Full Crypto-Taxidermical Index, a reference to the embalming of creatures that do not actually exist, is displayed under glass. It includes a collection of tiny objects derived from Nature such as an empty chrysalis or the quill of a porcupine. Some of these items are real; others were crafted by the artist. It is impossible to distinguish which. A partial reconstruction of the studio-apartment where Ar lives and works reveals his eclectic tastes as a collector. Displayed in his home, but also seen in the background of the self-portraits he paints, is a curious mixture of objects, including a fireman’s helmet, designer chairs, a bust of the goddess Hermes, and a plaster relief advertising underwear. The artwork of some participants is linked to their collections. 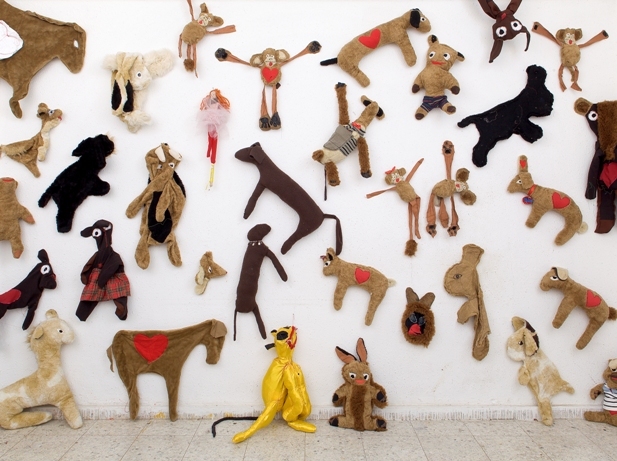 Gili Avissar, for example, collects soft dolls. But he makes them himself from left over fabrics gleaned from upholstery and furniture shops near his South Tel Aviv home. Pinned to a gallery wall is a delightful medley of bears, rabbits and other little animals that he produces, each having a distinctive personality. It was fascinating to learn that one source of inspiration for the unconventional jewelry designs of Esther Knobel is her family’s collection of toys; the little tin figures, robots and Babushka dolls locked away in her particular ‘cabinet of wonders.’ On a table nearby are examples of her jewelry which combine expensive and cheap materials, among them a Rose brooch fashioned from nickel silver and a lump of chewing-gum. David Adika’s collection of touristy souvenirs – carvings of a woman balancing a jug on her head, an elephant and a rhinoceros, are the focus of Mahogany, his fine photo series. With each wooden figure set against a dark background, but brightly lit, Adika’s camera transforms these commonplace objects into things of beauty, blurring the distinction between the humblest of craftwork and fine arts. 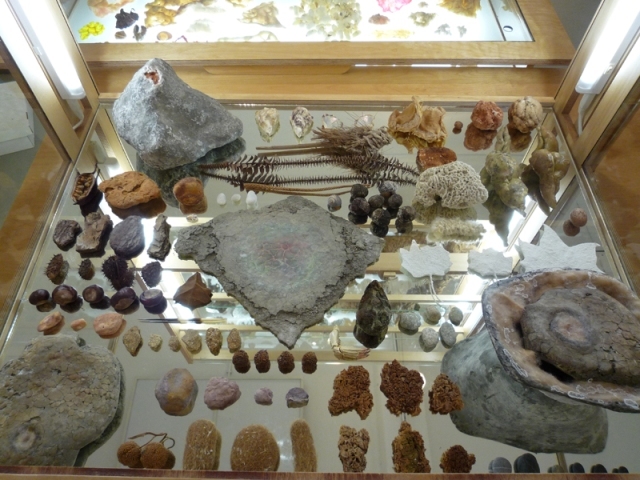 Irit Hemmo challenges the authority of Natural History Museums to display only genuine objects. She offers instead brilliantly colorful collages formed from the overlapping arrangement of hundreds of color photos of plants and leaves clipped from magazines. In contrast, Michal Shamir utilizes real vestiges of Nature for her delicately beautiful digital prints which recall superior examples of the art of flower pressing, a fashionable hobby for woman in Victorian England. To achieve her final effect, Shamir collects flowers and dead insects, drying and laying them out, before adding in some more details in pencil or watercolor, prior to the final scanning process. 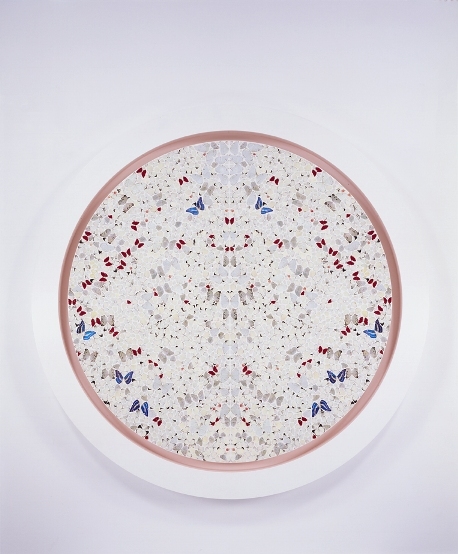 Among the exhibits, the crown in the jewel is undoubtely a wall piece by Damien Hirst from his Butterfly series. One of the most famous and controversial artists in the world today, Hirst is best known (and frequently reviled) for his Natural History series in which the carcasses of animals were preserved in formaldehyde. For Serenity, a work brought here from New York, the grey, white and blue wings of hundreds of butterflies would have been used to compose the exquisite tableaux now on view. This piece, like others devised by Hirst, is intended to raise questions concerning the fragility of life and the possibility of preserving tangible memories. Tali Amitai-Tabib, Untitled, 2009, from the Camondo series, color print. “are connected by more than phonetic associations…. (they) are like the family sepulchers of works of art.” A significant number of works effectively reflect this viewpoint. 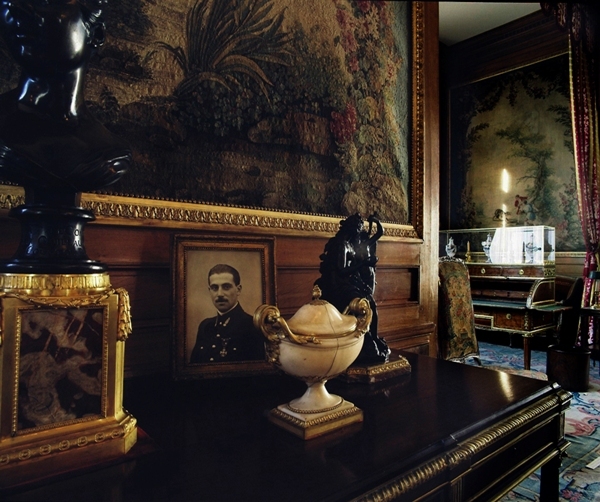 Tali Amitai-Tabib photographs the interior of a grand house in Parc Monceau, Paris once owned by a Jewish banker Count Moise de Camondo, but bequeathed to the French people in memory of his son Nissim, who died in combat in 1917. As her camera pans the length of these immaculately preserved rooms alighting on examples of antique furniture and porcelain, photographs of Camondo’s dead son come into view; stressing the impression that one is looking at a mausoleum not a museum. Achieving an equivalent effect in quite different surroundings, Dana Levy has taken her video camera inside one of the oldest Natural History Museums in Israel, and probably the least visited. Here she lets loose and photographs a flock of white pigeons, so that the bird-life contrasts sharply with the deathly silence of a place inhabited by creatures, stuffed and long dead. Polish artist Robert Kuśmirowski has created his own private museum inspired, so it seems, by memories, his imagination and his country’s recent history. Captured on video is The Collector’s Massif, a work shown by Kuśmirowski in 2009 at Bunkier Sztuki, a Krakow art gallery. Thousands of objects are on view: books, pianos, cameras, sculpture, toys, and paintings – the list is endless. In one room they are arranged in an orderly fashion and brightly lit; in another, closed off by a wire screen, the objects, seen in semi-darkness, are piled one on top of the other. Many of these items appear to be genuine antiques; others are apparently crafted by the artist himself whom we see in several clips bending over his worktable. Inevitably, at least for an Israeli, the character of Kuśmirowski’s collection brings to mind homes and treasures forcibly abandoned by Jews in Nazi Europe. The practice of undermining the institution of the museum, its methods of classification, its elitist character, is not a contemporary phenomenon. As illustrated in A Disturbed Economy: Collecting as a Conceptual Practice, one of seven satellite exhibitions also on display at this venue, this trend was especially evident in the 1970s. To present this historical viewpoint curator Ilana Tenenbaum has assembled video films, photos and other documentation from that decade pertaining to the work of three artists: the Belgian Marcel Broodthaers, Swiss-born John Baldesari; and the Israeli Dov Or Ner. To give a single example: Or Ner established a theoretical Museum of Museums in the belief that relationships between artists were more rewarding than the services offered by institutions of art. For one of his projects Orange Action, he posted oranges to 25 famous artists abroad, requesting them to record what was happening in their lives during the time it took for the oranges to decay. Friendships results from this venture. Andy Warhol, for example, sent Or Ner two signed tins of Campbell soup which were ceremoniously buried, one in Israel, one in Alaska. 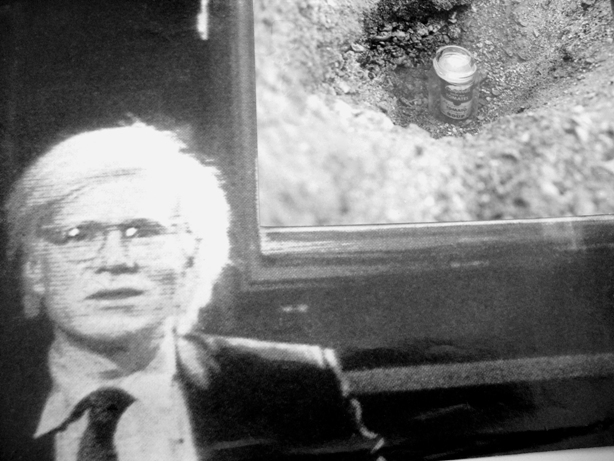 A photo on display in the exhibition shows Warhol in front of a photo documenting the burial of one of these cans. Ironically, the anti-museal activities of these three artists are now being preserved –where? In a museum.